Here in New England, while winters are cold and wet, summers are often hot and dry. Your lawn and gardens go from fun activities to daily slogs to make sure your plants don’t dry out. Between rising water bills and droughts, it’s not just about the effort, but also about the money. Between rising utility bills, water scarcity, and sheer effort: it’s time to make summer watering easier by doing it smarter. From picking the right time of day to the type of installations that make water hands-free, here are some easy summer watering tips to keep your plants and lawn healthy and green throughout this season. Water Your Plants & Lawn Early: The best time of day to water your plants is in the morning. This allows plant roots and the ground to soak up the moisture before the temperature heats up. This means getting up (or turning on irrigation) and watering before 10:00 AM in warm climates. If you’re not a morning person you can water late afternoon or night, but leaving plants’ roots wet overnight can cause mold and mildew issues. 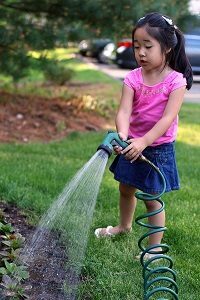 Water Your Plants & Lawn Deep: When it comes to watering, you’ve got two options: either you can water lightly daily to keep your plants watered, or you can do more infrequent deep watering where you let the water run longer. By watering deeply you build up a moisture layer deeper beneath your topsoil, promoting deeper root growth. If you’ve got plants which only have shallow root structures this can pose a problem, but remember that most weeds also have shallow roots, so this can be an effective way to help weed your garden. Mulch Your Garden: Mulch isn’t just appealing landscaping or providing nutrients to topsoil: mulch also makes a great shield against evaporation. By putting down a heavy layer of mulch down in the summer, you help trap moisture and keep the topsoil from drying out. Plus, mulch will help you keep those weeds down and your garden looking great. Looking for a more hands-free approach? You can automate the watering of your lawn and gardens by the use of sprinklers and drip lines. Spray sprinkler systems are great for watering turf areas with minimal effort, while drip systems are perfect for planting areas and gardens with delicate foliage. You can learn more about your irrigation options here. Want a hand with installations and landscaping? Contact the experts at Greener Horizon. We can help you with irrigation installations, season mulching and lawn care, and much more. Contact us now for a free consultation in Eastern Massachusetts and Rhode Island.